News Archive — York Electric Cooperative, Inc. Whether you are a researcher, YEC member or you simply want to know more about York Electric Cooperative, take this opportunity to browse our news archive. 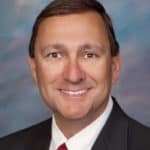 Paul Basha, CEO York Electric Coop discusses protecting members from Santee Cooper debt, solar power and more with Manning Kimmel on Straight Talk. It Pays to be a Member of York Electric! $1.5 Million: The Most Capital Credits in 78 Years! York Electric is giving money back to members again this year. As a not-for-profit utility, York Electric returns revenues that exceed operating costs to members as Capital Credits. In May 2019, your cooperative will retire $1.5 million to people who were members during 1996, 1997 and 2017. Returning Capital Credits is just another way York Electric is always looking out for you. In May, we will return $1.5 million to members who received service in 1996, 1997 and 2017. Members will receive Capital Credit checks in the mail. If the member's refund is less than $15, the amount will be printed as a line item credit on the utility bill. The amount of Capital Credits returned is determined by margins and a percentage of your total energy billings for the years listed above. Questions? Call (803) 684-4248. The value of your membership goes beyond saving money on your power bill. Members are the heartbeat of York Electric and our most valuable asset. That's why we do everything we can to look out for you, improving your quality of life and taking your service to the next level. Let's look at an overview of what you're worth to us. As a member of the co-op, you get a piece of the pie. YEC returns any amount of money we make in excess of our operating costs back to our members in the form of capital credits. This year, we are retiring the largest amount of capital credits in our history—$1.5 million dollars. Last month you learned that you are served by locals, making the value of your membership personal to all of us here at YEC. Our commitment to community runs deep, which is why we are asking for your help to pay it forward at the Annual Meeting. Bring a canned food item with you on May 11th and be entered in a drawing for a $100 power bill credit that will take place on Monday, May 13. The winner will be notified by phone. All donations will go to PATH, a 501c3 organization that helps feed the hungry. To learn more about how you can help, visit pathyork.org. Rest assured we've got your best interest in mind. You can trust us to always try to do the right things for the right reasons because you are worth it. Thank you for being members of YEC and for supporting your co-op. I look forward to seeing all of you and your families at our meeting on Saturday, May 11, to celebrate the value of your membership. You are hereby notified that the following amendments to the Bylaws of York Electric Cooperative, Inc., will be proposed and offered for adoption at the annual business meeting of members of the Cooperative to be held on May 11, 2019, at the Cooperative's headquarters located at 1385 East Alexander Love Highway, York, South Carolina. The following members of the cooperative are candidates for trustees to be voted on during the Annual Meeting by acclamation for a three-year term, beginning May 2019. Is drive-thru registration an option this year? Yes, drive-thru registration is available from 8:30 A.M. until noon. Members who register through the drive-thru will receive the $15 power bill credit and will be entered into a single drawing for a $500 Electric Bill Credit but are not eligible for the door and grand prize drawings. The drawing will be held after the business meeting and the winner will be notified by phone on Tuesday, May 14. See the map to locate the drive-thru. Members MUST bring a valid photo ID to register. Also, please bring your registration postcard. ONLY members NOT planning to participate in any of the Annual Meeting festivities, including food purchases, children’s activities, overall entertainment and business meeting, should plan to utilize the drive-thru registration. Also, parking will not be an option for those who register at the drive-thru. Where are the door prizes given away and do I have to be present to win? All prizes will be given away directly after the business meeting. The approximate time is 12:45 p.m. Members do not have to be present to win the first half of the door prize drawings, but MUST be present in order to win the second half and grand prize drawings. Members who register in the Drive-Thru are not eligible for the door and grand prize drawings. What is the Annual Meeting and why should I attend? The Annual Meeting is a meeting of YEC’s members and a special occasion for members to participate in cooperative business and meet their cooperative leaders and employees. It’s a family affair with a festival atmosphere; the event flourishes with a wide array of activities. Music will fill the air as children explore their way through an inflatable obstacle course and race down a 22 foot dual slide. The aroma of popcorn will entice you to visit the participating food vendors to see what food options they have for you to purchase. Each member who is present and registers receives a registration gift and will be eligible to win door prizes. Most importantly, members can exercise their cooperative right to vote in the election for seats on the cooperative’s Board of Trustees. During the business meeting, the President and CEO will inform members of current events and share important information pertaining to the cooperative. YEC’s bylaws require an Annual Meeting to be held. When is the Annual Meeting held and how will I be notified? The Annual Meeting is Saturday, May 11, 2019. Members receive a registration postcard in the mail the last week in April. Members are also notified through the South Carolina Living magazine. Where and what time is the meeting held? The meeting is held at YEC’s main office. The address is 1385 East Alexander Love Highway in York, SC. Registration begins at 8:30 a.m. and concludes at noon. The business meeting begins at noon and ends at approximately 12:45 p.m, Saturday, May 11, 2019. What is the registration gift for 2019? The 2019 registration gift is a $15 power bill credit. The registration gift is offered as an incentive to encourage members to attend the Annual Meeting, May 11, 2019; therefore, the registration gift is ONLY available to those members who are present. This applies to members who have health-related illnesses or emergency situations. Members who attend are not allowed to register their friends and neighbors by bringing their registration cards. Can I receive the registration gift if I can’t come? The registration gift is offered as an incentive to encourage members to attend the Annual Meeting; therefore, the registration gift is ONLY available to those members who are present. This applies to members who have health related illnesses or emergency situations. Members who attend are not allowed to register their friends and neighbors by bringing their registration cards. How do I register and vote? In order to register and vote, you must bring a valid photo ID. It is also important for you to bring your registration postcard because it has a barcode, with information pertaining to your YEC membership, printed on it. The barcode is scanned and this process minimizes the wait in the registration lines. Who are the candidates running for the 2019 Board of Trustees election? The candidates running for the Board will be published in April’s issue of the South Carolina Living magazine. How do I enter the door prize drawing? Once you are registered you are automatically eligible to win a door prize. Your door prize tickets are attached to your registration postcard and will be removed during the registration process. At the end of the registration line, you will drop one of your door prize tickets into the prize collection box. You will keep the other portion so you will be able to know whether or not you are a winner when the door prize ticket numbers are called. When are the door prizes given away? All prizes will be given away directly after the business meeting. The approximate time is 12:45 p.m.
Will the Annual Meeting be held if it rains? The Annual Meeting will be held rain or shine. If there is a threat of a major storm, a decision will be made the Friday before the meeting. If it is necessary to cancel the Annual Meeting, an announcement will be made and a message will be posted to the homepage of our website. Will the parking be the same as last year? What do I need to do if I am handicapped? If you do not plan to stay for the business meeting, please take advantage of our convenient drive-thru registration. If you would like to attend the meeting, please make sure your handicapped placard is visible from your automobile. You will be directed to the handicapped parking area and a shuttle will pick you up and take you to the registration lines. What activities will be available for children? Every child 12 years old and under who registers will receive a gift. They will be able to explore the inflatable obstacle course and race down a 22 foot dual slide. Cotton candy, snow cones, candy apples, popcorn, etc. will be available for purchase through TC’s Shaved Ice. At noon, during the business meeting, a safety demonstration will be held. How can I make sure I get to purchase 25-cent hot dogs this year? Last year they sold out. A total of 8,000 hot dogs will be prepared. YEC encourages members to purchase hot dogs early. Your cooperative plans for the hot dogs to be sold out every year so there is no waste. The 78th Annual Meeting of the Members of York Electric Cooperative will be held on Saturday, May 11, at YEC's main office, located at 1385 East Alexander Love Highway in York. This year we will be celebrating the value of your membership. Plus every member who brings canned food to benefit PATH, will be entered into a drawing for a $100 Electric Bill Credit! 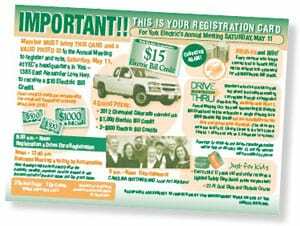 Look for your registration card to arrive soon and bring it with you to the Annual Meeting. Members are encouraged to attend the Annual Meeting and MUST bring a valid photo ID and their registration postcard, which will be mailed at the end of this month. Each member registering at the meeting and in our drive-thru registration will receive a $15 credit on his or her electric bill, limit one per membership. You must be present to receive the credit, which will be applied to your bill dated June 2019. 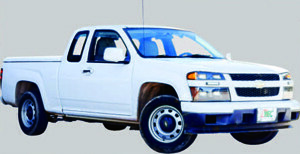 Registered members will also be entered into drawings for valuable prizes. Turn to page 24A in the April 2019 edition of South Carolina Living or download the PDF below for details about the prizes and other fun activities planned for the meeting! You may also download the new drive-thru registration map online below. Members who need accommodations due to physical impairment are asked to contact YEC in advance at (803) 684- 4248. During the business meeting, an interpreter for the hearing impaired will be provided. Also, please note that backpacks are subject to inspection by law enforcement while on site at the Annual Meeting. Your cooperative's audited financial report will be available at the Annual Meeting and during the week of the Annual Meeting at both of YEC's office locations. If you have any questions about the event, please contact our member services department at (803) 684-4248. I look forward to seeing you and your family on Saturday, May 11, 2019. The amendments to YEC's bylaws, which will be proposed and offered for adoption at the Annual Meeting, can be found on page 24B of the April 2019 edition of South Carolina Living. 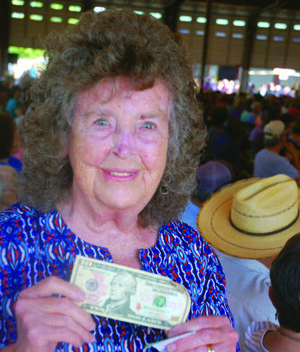 You will also find more information about your 78th Annual Meeting, 2019 Capital Credits and the value of your membership in this edition's York Extra pages! A core value of cooperatives upheld by local people you know and trust. YEC is proud to have local people looking out for you. We are residents like you, sharing your same values, schools, churches and aspirations of providing good lives for our families. Our dedication to making a difference goes beyond our job descriptions; we care about the heart of the matter–the great communities we share in York, Chester, Lancaster and Cherokee counties. Making your life better means we are making life better for our friends and family. Therefore, our commitment runs deep, our intentions are honest, and our promise is true. They say there is strength in numbers, and we believe that's true. We have many different departments at YEC that work together to provide you with excellent service. We would like to introduce several of our employees who work hard each day to serve you in different capacities. And guess what? They are co-op members, too. Keep an eye out for more locals serving you in future editions. Let us introduce you to York Electric's employees—and a few family members. Hear their thoughts on being a part of our community and serving you. 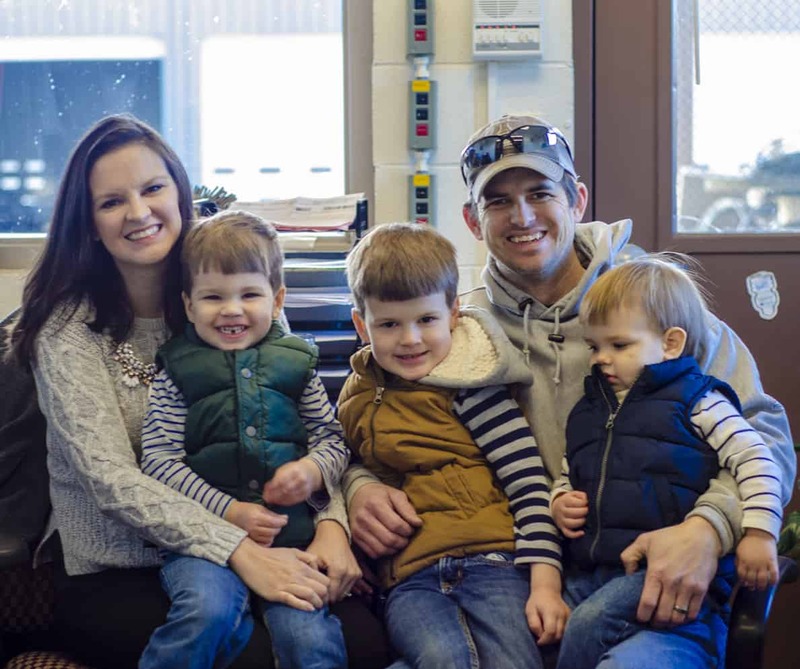 Staking Engineer Wes Dover and his wife, Hayley, with their three kids (from left), Anna Kate, Miller and Maddox. Q: How long have you been members of YEC and how long have you been an employee? Wes Dover: I've been an employee just a few years longer than I've been a member. I started at YEC in 2001 and have been a member since 2003. Wes: One benefit of my job is being able to meet with members and help determine how to get them power. By living and working in our community, I have the opportunity to continue that relationship afterwards. Q: Speaking of providing for your family, does your job affect your family life? Wes: Sometimes I'm not able to make school functions or family dinners, but it is for a good reason. Since I'm helping other people, my family appreciates what I do and understands my absence. Luckily, we don't have many outages, so I can be there most of the time. Q: Anna Kate, what do you think about your dad being away working? Anna Kate: I wish he was there, but I understand that his job is important. He's helping other families in our community when they need it most. Wes: It's a team effort–both at work and at home. Hayley and my kids support me so that I can do my job to the best of my ability. Whether I'm helping get the lights back on or planning for future growth–it's all about taking care of our members. At YEC, we all work together to provide our members with great service and make a difference in our community. Q: What do you do here at YEC? 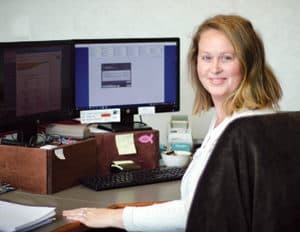 Jamie Duston: I am the front office coordinator at YEC, and my goal is to provide support and leadership to our front office staff including collections, cashiers, and our Fort Mill branch office. My ultimate goal is to take care of our member services team so that they are well-prepared to give excellent customer service every day. I also work directly with members and give every effort to go above and beyond to make their experience a pleasant and simple one. Jennifer Brooks: My role as call center coordinator is to provide support and leadership for the ladies in the call center. I'm usually signed into the call loop taking calls and taking care of the members just like the others in the call center. Q: What is the most rewarding aspect of your job? Jamie: I would say the most rewarding aspect is when I know I have really made an impact in someone's day, when I know that what I did provided hope to what seemed to be a hopeless situation. Jennifer: The most rewarding part of my job is being able to help our members. We receive all types of requests in the call center, so making sure our team has the knowledge to take care of each question is important. Whether we are looking at a member's billing question, connecting new service, entering an order for a repair or reporting an outage, we have the opportunity to make a difference and show our members the value of their membership. Q: You are both members of YEC. Do you feel like that impacts your decisions at work? Jamie: I feel like being both a member and an employee help bring things full circle for me. I am proud of what I do because I know what kind of service York Electric provides both in the field and within the office. Jennifer: In every decision I make, I think about what is best for our members. I always try and treat people the way I would want to be treated whether at work or in my personal life. Q: How do your families feel about being members of the co-op and about your job here? Q: You two have some of the most hazardous jobs at YEC. Why do you do what you do? Jeremy Huffstetler: I like the challenge of my job and learning new things every day. I also get to apply what I know to help members. I help them troubleshoot any problems they are having and point them in the right direction to get them repaired. If I can fix it, I do, so that it saves the member time and money. Zack Smith: I enjoy working in a dynamic environment. I'm also proud to be part of an organization that strives to serve the community in a positive way. Q: You are also both members of the co-op. How does it feel to be an employee and a member? Jeremy: As a co-op member, you know you are going to receive safe, reliable power. As an employee, we play an integral part in making that statement true. When my family and I cut the lights on, I know I played a part in providing that service. My family and I have lived on co-op lines for four years, and I have been a lineman here for almost 11 years. Zack: I've technically been a member all of my life. I grew up on co-op lines, have been an official member for the last 13 years, and an employee for 12 years. It's satisfying to provide the same level of service to my family that I provide to my friends, neighbors and the membership. 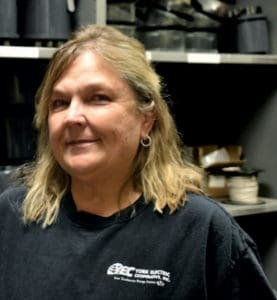 Meter Specialist Cathy Heffner served the co-op for 29 years before retiring earlier this year. Q: You've been an employee for a while. What has made the biggest impact on you? Cathy Heffner: Being an employee of the co-op has allowed me to see our community in a different light. I've been blessed to meet so many wonderful people working in the field as a meter technician. Sometimes, you need to be a friend. Sometimes, you need to offer your help. Sometimes, the people you meet give you help you didn't know you needed. My job allowed me to appreciate the power of human connection. Cathy: We truly care about our members. Being local and a member myself, I'm able to help my neighbors and my friends. As an employee, I'm making a difference where I live and in the lives of people I know. Helping others is a way of life that won't stop after retirement. Q: What role do you play in looking out for our members? Karen Good: I look out for the members from an accounting perspective. I do my best every day to make sure the cooperative's financials are recorded properly as all profits are returned to the member through capital credits. Q: How long have you been at YEC? Karen: I joined YEC in May 2017. Q: You are a member, too. What does your YEC membership mean to you and your family? Karen: There's a different culture here that I greatly appreciate. We don't cut corners. Employees take their tasks at hand seriously and everything is completed with the highest quality. Being an employee and seeing day to day business makes me even more appreciative as a member because I know YEC, as a whole, is looking out for the member first and foremost. Q: What does community mean to you? Karen: To me, community means people supporting one another. We all work as a team and support each other, but we also support our community through various programs and events like Operation Round Up and the Teddy Bear Trot. I'm happy to be a part of the co-op and our community. Ben Hall: I am the warehouse coordinator for YEC and have worked here for seven years. For the first three years here at the co-op, I was a lineman. I've been a member for 31 years–nearly all my life–and now live in my family's old farm house with my wife and three boys. Q: What does membership mean to you? Ben: Membership has a unique meaning for me. I grew up knowing a lot about the co-op because my grandmother, Jean Hall, was an employee here back when the YEC office was in downtown York. When she married my grandfather, John Hall, a state cooperative newsletter headlined their announcement as the "Co-op Wedding." My grandmother, the co-op employee, married a member. The co-op was a lot smaller then, so being a member was exclusive. Even though we have grown a lot over the past 78 years, your co-op membership still means the same today–we are still owned by those we proudly serve and employ people from around here. 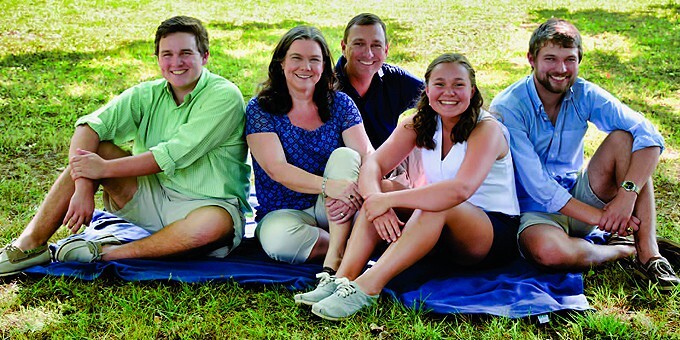 Q: What does being a co-op employee mean for your family? 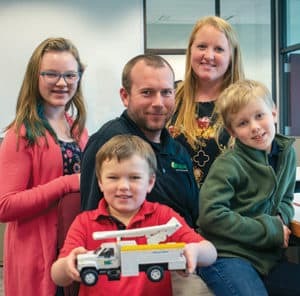 Heather Hall: Although Ben is busy at work and sometimes has to leave us when outages occur, I'm grateful his job allows him to provide for our family. My husband is a talented guy–kind of a "jack of all trades," so it makes me happy and proud to know that he can use his skills on the job, helping other people. Ben: There's something new every day in my job. I like being able to use my knowledge to help take care of our members and other employees. 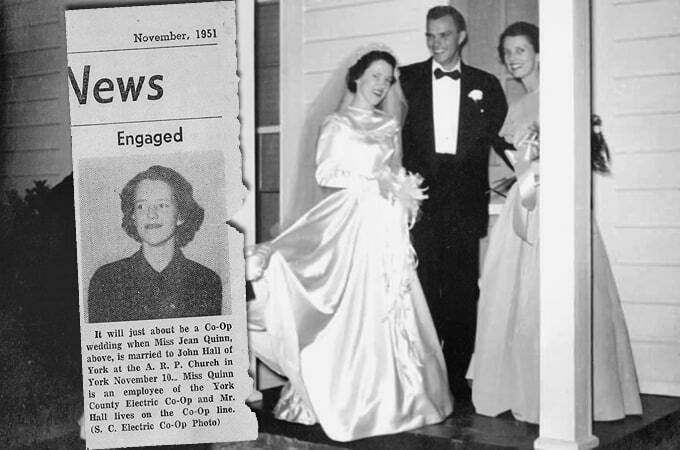 The wedding of Mr. and Mrs. John Hall was featured as the "Co-op Wedding" in a 1951 edition of South Carolina Electric Co-op News. A predecessor of South Carolina Living, the publication featured YEC employee Jean Quinn after she married co-op member John Hall. Their grandson, Benjamin Hall, is now our warehouse coordinator. The happy couple is pictured (above) with Rachel Wallace and Edward C. "Punk" Black, husband of Jean's sister, Polly Black Rogers. They were the grandparents of another YEC employee, Lineman Paul Black. Establishing a connection when you meet someone new is a typical conversation starter. We all want to find common ground, which usually starts by playing the name game. Finding a mutual friend bridges the gap between strangers and acquaintances. Suddenly, because you know the other person's friend or family member, you are welcomed into the inner circle, vouched for, and taken seriously. Building those relationships is an important part of your cooperative's values. Community. Service. Family. Our members. You. Let's take a minute to get acquainted. My name is Paul Basha, and I am a proud YEC member. I'm a family man–a normal guy–just like you. I bet if you asked around, I'm not the only person you might know that works here at your co-op. Relating you to the local men and women who are dedicated to serving you with excellence should provide you with a peace of mind and comfort in knowing you are a priority at YEC. Our commitment to our members is much deeper than any other utility. As a co-op, we are dedicated to improving our communities and the lives of those around us. 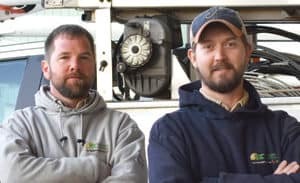 We take every outage, phone call, question, new construction, security light, and economic development opportunity seriously because it matters. These ideals come naturally to us because we live where you live. We eat where you eat. We shop where you shop. Our kids attend school with your kids. We worship where you worship. Your service matters to us because we work in the same community you do, and a lot of us get our power from the same place you do. The men and women who respond during an outage experience the same outages at their homes, too. We are real people, who value the same things as you do, answering the call to provide you with the safe, reliable and affordable energy you deserve. Enriching lives means helping our neighbors, our coworkers, our friends and family–you. That's the power of human connections. That's why we are proud to have local people serving you. Likewise, your relation to YEC is more than just a consumer; you are a member and an owner of your co-op. This is the most important connection of all. 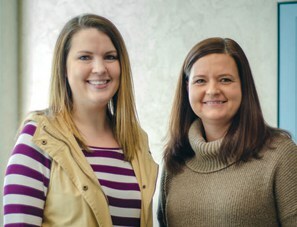 In this issue, we would like to take the time to introduce you to some of our employees who are members just like you. If you didn't know them before, we hope you take the time to make some new friends. As for me, it's nice to officially meet you. 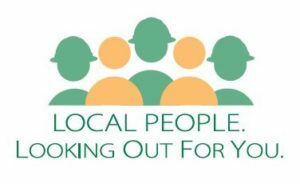 Remember, we are local people looking out for you–and that's the cooperative difference.